A Rouse Family Recipe passed down from generation to generation. Options for Regular or Spicy Chicken. White meat chicken double-battered and fried in 0% trans fat oil. Served with your choice of Rouses Sweet & Tangy BBQ sauce or Ranch Dressing. Double-battered and fried in 0% trans fat oil. For more information or to place an order call your local store. A Louisiana favorite, wrapped in a golden brown flaky crust, fried to perfection. Served with Wow-wee sauce. Assorted Rouses deli meats and prepared salads. Mix and match Rouses roast beef, ham, turkey, chicken salad, tuna salad and egg salad. 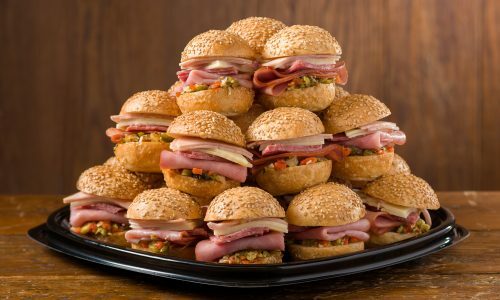 Italian meats and cheese with olive salad on seeded Italian bread. 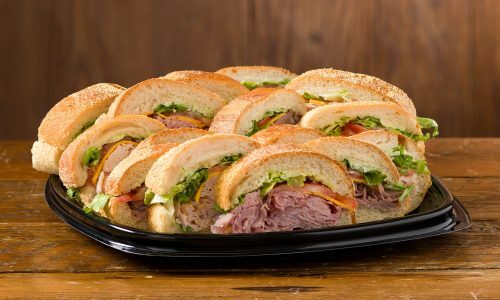 Mix and Match Rouses roast beef, ham and turkey dressed on French bread. Pork, cabbage, carrots and onions in a crisp, flaky, fried crust. Served with chili sauce. Overstuffed with our Rouse Family Recipe chicken salad. 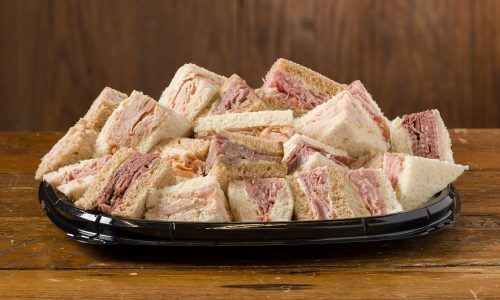 Choices include our Rouse Family Recipe Chicken Salad, Ham & Swiss, Chicken Bacon Ranch and Vegetable. Served with your choice of sweet and tangy BBQ sauce or our zesty Marinara Sauce. Large white mushrooms stuffed with Rouses signature Italian sausage. Traditional stuffed eggs made with Rouses mayonnaise and yellow mustard and garnished with paprika. All beef miniature hotdogs fried in a crispy corn batter. Served with yellow mustard. A 7-layer bean dip made with refried beans, pureed avocado, seasoned-sour cream, salsa, cheddar cheese, pico de gallo and black olives. Our signature Spinach and Artichoke dip, zesty Spinach Crab dip, and assorted seafood dips. Crackers and chips available for additional price. 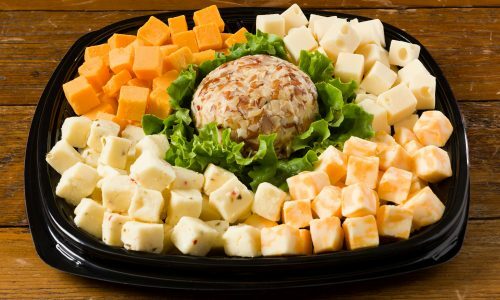 Cubed cheddar, Swiss, Colby jack and Pepper Jack with an almond-covered Cheddar, Parmesan Ranch or Port Wine cheese ball. Custom trays also available. 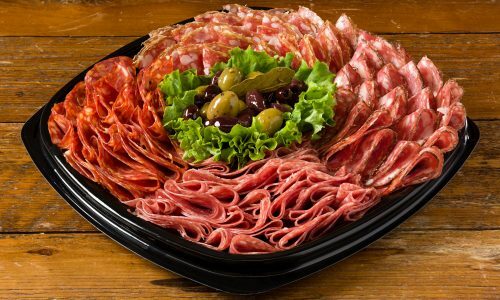 Hand-sliced salumi and Italian specialty meats. Served with olives. Ham, Turkey, Roast beef, Cheddar, Swiss, Monterey and Pepper Jack. Additional $5 charge for Columbus Craft Meats and Cheeses. Creamy New Orleans-style red beans made with diced smoked sausage. Rice sold separately. Creamy vegetarian white beans. Great with fried fish. Rice sold separately. Our award-winning Chicken & Sausage, Seafood and Shrimp & Okra gumbos. Rice sold separately. Pasta tossed in a meat-based Italian tomato and red wine sauce. An Italian classic with Bolognese sauce, mozzarella, provolone and parmesan cheese. Fettuccini tossed in a creamy parmesan béchamel sauce. Available with chicken, shrimp or crawfish. Slow roasted with onions, garlic and spices. Served in beef gravy. Slow smoked over pecan wood. Sliced to serve. Slow smoked over pecan wood and hand-pulled. Fresh romaine, cucumbers, cherry tomatoes, shredded cheddar cheese and croutons. Served with your choice of dressing. Sliced potatoes in a creamy cheddar, parmesan and Gruyère cheese sauce. Fresh zucchini, yellow squash, red onion, assorted bell peppers, sautéed in Extra Virgin Olive oil with garlic and fresh herbs. Elbow noodles in a creamy cheddar cheese Mornay sauce. Choice of tri-colored rotini pasta tossed olive salad and an elbow macaroni in a creamy mayonnaise-based dressing. Traditional Louisiana-style dirty rice made with gizzards and ground beef and peppers. Real potatoes mashed with butter, cream, salt and pepper. Our signature sweet and savory corn soufflé. A sweet tomato-based version made with onions and peppers. Available in Home-Style with Yellow Mustard, Home-Style with Egg, Deviled Egg or New Orleans-Style with Boiled Red New Potatoes. Traditional New Orleans-style bread pudding made with French bread. Traditional style made with crab boiled seasoned puréed wild-caught Gulf Shrimp blended in a cream cheese sauce. A Rouse Family Recipe. 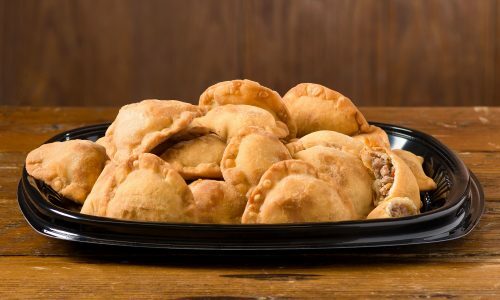 Deep-fried handheld pies with seasoned Louisiana crawfish tails, onions, garlic and black, white and red pepper. Our take on the Jazz Fest Favorite! French bread stuffed with Louisiana crawfish tails tossed in creamy cheddar Mornay sauce. Wild-caught Gulf shrimp wrapped in crispy bacon. Includes 96-ounce caraf of decaf or regular coffee. Petit fours, cream puffs, fudge bites, brownie bites and mini éclairs. Serves 15-20. Assorted varieties of our signature sweet cream Bundt cakes. Serves 25-30. Gourmet cookies, various flavors. Serves 25-30. Macaroons, brownie bites, Turtle cookies and mini chocolate chip cookies. Serves 25-30.